For all who assisted with the refurbishment project at the Parish Centre. There were 55+89+93 = 231 at Mass last weekend. Thank you for your offering of £484.35 + £318.27 = £802.62. Advanced warning that Fr. Michael will be taking a break from the parish (you probably need a break from him….) from Monday 15th May until Friday 2nd June. We have a very active Knights of St. Columba in Carlisle. I would encourage all the men of the parish to consider joining the Knights of St. Columba to assist you in the living out of your Catholic faith. Don’t just watch from the sidelines - get involved…. Our Lady of Furness, Barrow is seeking to employ a committed practising Roman Catholic as a Parish Outreach Worker. The role will be primarily to support, develop and implement the parish mission in all aspects of the Gospel. The post is for 21 hours per week with a salary of £10,952.00 pa. For more info please call 01229 820210 or email office@olof.org.uk;. Closing date Thursday 4th May 2017. A website offering a helping hand to those grappling with issues around death & dying. Based in the Catholic tradition, but open to all, it features real-life stories about dealing with the journey through death to eternal life. The Holy Rosary will be recited after the celebration of each weekday Mass during Lent. There will be a Rosary Procession and crowning of the image of Our Lady after Mass at St. Margaret Mary on Sunday 14th May. Northern Star Travel have a group booked to travel to Lourdes by coach, which co-insides with the Lancaster diocese. They currently have 14 places available. Lourdes by coach: departing from Preston on 20th July for 10 days with no overnight travel, staying at 4* Hotel Paradis Lourdes, at a cost of £600 per person sharing or £775 if a single room. For further information, please contact Ged Conroy on 01772 728071 or Northern Star Travel on 0161 773 2115. Meet on Tuesday evenings in the Parish Room at St. Margaret Mary…this month’s theme is apparently a ‘beauty evening’ which is, as we know, at times, only skin deep. Alternatively, come along to Unlocking the Mystery of the Bible and discover the depths the ‘beauty’ of God’s plan can take us…. Thank you to all who participated in the Lenten Lunches in aid of ‘Mary’s Meals’. A donation of £100 was sent from St. Margaret Mary and £160 from Christ the King. What with Greg away en vacance and Karen on maternity leave [congratulations to her and Stephen on the birth of Alexander Nicholas…] we’ll be relying on the lungs God has given us for a few weeks….sing up soldiers! The next date is Saturday April 29th and will be held at St Edmund’s Church, Orton Rd, Carlisle. All welcome. Renewal days start at 11.00 am and finish around 4.00 pm. Please join us even if you cannot stay for the full day. Tea and coffee provided but please bring a contribution to a shared lunch. Contact Janice Wrench on 01768 868489 for further info. with Fr Christopher Loughran. We wish him well in his ministry. Bishop Campbell has asked that weekday Mass times in other churches be published in newsletters, especially if a priest is going to be away, since ‘Eucharistic Services’ are not permitted during the week. These are, of course, subject to change for a variety of reasons [e.g. funeral Masses]. Check before you travel. Many thanks again to those who have helped during Lent and especially during the celebration of the Triduum - making the liturgies such an opportunity of prayerful encounter with our Lord. Much work goes on behind the scenes to enable this to happen and I am very grateful for the often hidden contribution made by so many in the parish. For the many who simply ‘turn up’ and expect ‘everything to be done’ - perhaps offer a prayer for those who work so hard to make things happen in the parish - and perhaps consider stepping forward to contribute in an active way. We have recently received a grant from the County Council to help with a refurbishment of the Parish Centre. We are blessed to have a centre which we can use as a parish - I am also grateful to those who help keep it going. Help is needed from parishioners. Any Parishioner who has time to assist in the Parish Centre Concert Room refurbishment from 21-26 April, please contact Paul Lovell 07788818535 for further details of ways to help. The next gathering will be this Tuesday, 25th April when we’ll consider St. Thomas Aquinas - who we missed out at an earlier stage. 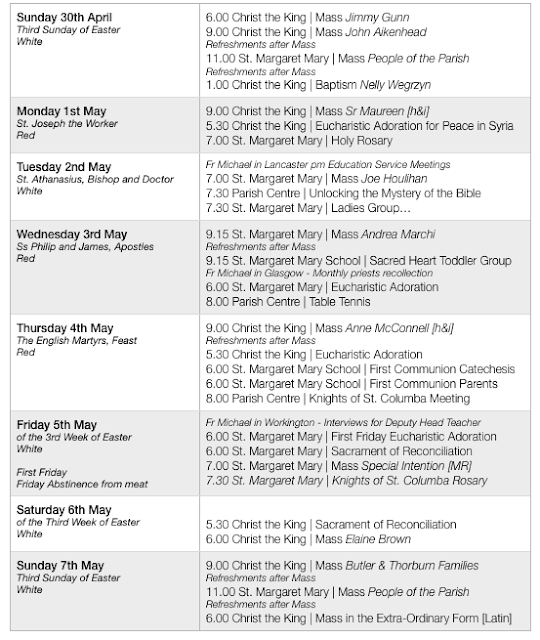 Holy Thursday - 75 ; Good Friday 115 [£79.50 for Holy Places]; Easter Vigil - 75. Easter Sunday 116 + 136. Easter Offering £489.05 + £395.95. Our diocesan residential youth centre, Castlerigg Manor, Keswick invites you to join in their Family Weekend: 28-30 April. For more information, visit www.castleriggmanor.co.uk, e-mail team@castleriggmanor.co.uk or phone the team on 017687-72711. St Joseph's Catholic High School (11 to 16), Workington is currently looking to appoint the following staff: Senior Deputy Headteacher, the post requires the holder to be a practising Catholic; Maths Teachers; Science Teachers. All details at www.st-josephs.cumbria.sch.uk or contact Sybil Worsley, Business Manager , on 01900 873290 or sw@st-josephs.cumbria.sch.uk. 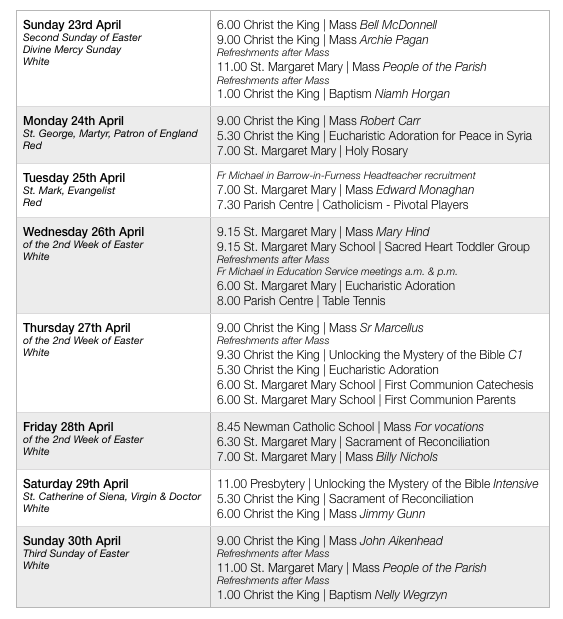 The celebration of Divine Mercy will be held in St Bede’s, Carlisle on Sunday 23 April at 2.30 pm. Experience the mercy and the love of the Lord in this celebration. Our Holy Father has appointed as the new Apostolic Nuncio to Great Britain, His Grace Archbishop Edward Joseph Adams, until now, Apostolic Nuncio to Greece. Bishop Campbell assured him of our prayers, welcome and best wishes as he takes up his new office. Archbishop Adams is from Philadelphia, Pennsylvania, USA. He was designated Apostolic Nuncio to Bangladesh on 24 August 1996 and was consecrated bishop on 23 October later that year. After six years as Papal Representative in Bangladesh, Archbishop Adams was named Apostolic Nuncio to Zimbabwe on 22 August 2002 and after serving five years in that country, on 3 September 2007, he was appointed Apostolic Nuncio to the Philippines. He has served as Nuncio to Greece since 22 February 2011. This news may speed up the process of finding Bishop Campbell’s successor as Bishop of Lancaster. Our Lady of Furness, Barrow is seeking to employ a committed practising Roman Catholic as a Parish Outreach Worker. The role will be primarily to support, develop and implement the parish mission in all aspects of the Gospel. The post is for 21 hours per week with a salary of £10,952.00 pa. For more info, please contact 01229 820210 or email office@olof.org.uk. Closing date: Thursday 4th May 2017. QUARR ABBEY: Monastic Experience Weekend for Catholic men 18-35. An opportunity to sample monastic life in the Benedictine tradition from Friday 2nd to Sunday 4th June 2017. For further information - novicemaster@quarr.org. Many thanks to those who have helped during Lent and especially during the celebration of the Triduum - making the liturgies such an opportunity of prayerful encounter with our Lord. Much work goes on behind the scenes to enable this to happen and I am very grateful for the often hidden contribution made by so many in the parish. For the many who simply ‘turn up’ and expect ‘everything to be done’ - perhaps offer a prayer for those who work so hard to make things happen in the parish - and perhaps consider stepping forward to contribute in an active way. We have recently received a grant from the County Council to help with a refurbishment of the Parish Centre. We are blessed to have a centre which we can use as a parish - I am also grateful to those who help keep it going. Help is needed from parishioners. Any Parishioner who has time to assist in the Parish Centre Concert Room refurbishment from 21-26 April, please contact Paul Lovell on 07788818535 for further details of ways to help. Thank you for your contribution of £548.24 There were 67 + 138 = 205 at Mass last weekend. Thanks to the Festival Choir and Musicians who have assisted so well in the music for Holy Week. Thank you for your generous response to this appeal. Food has been distributed to families in need in the area. Our diocesan residential youth centre, Castlerigg Manor, Keswick, invites you to join in their Family Weekend: 28-30 April. For more information, visit www.castleriggmanor.co.uk, e-mail team@castleriggmanor.co.uk or phone the team on 017687-72711. St Joseph's Catholic High School (11 to 16), Workington is currently looking to appoint the following staff: Senior Deputy Headteacher, the post requires the holder to be a practising Catholic; Maths Teachers; Science Teachers. All details www.st-josephs.cumbria.sch.uk or contact Sybil Worsley, Business Manager, on 01900 873290 or sw@st-josephs.cumbria.sch.uk. The Offertory Collection of Holy Saturday and Easter Sunday is, in the Diocese of Lancaster, a significant contribution to the stipend of parish clergy. In our parish, it is retained by the parish and contributes to Fr Michael’s monthly ‘allowance’ over the year. 2.30 pm. Experience the mercy and the love of the Lord in this celebration. Advanced warning that Fr. Michael will be taking a break from the parish (you probably need a break from him….) from Saturday 13th May until Friday 2nd June. Our Holy Father has appointed as the new Apostolic Nuncio to Great Britain, His Grace Archbishop Edward Joseph Adams, until now, Apostolic Nuncio to Greece. Bishop Campbell assured him of our prayers, welcome and best wishes as he takes up his new office. Archbishop Adams is from Philadelphia, Pennsylvania, USA. He was designated Apostolic Nuncio to Bangladesh on 24 August 1996 and was consecrated bishop on 23 October later that year. After six years as Papal Representative in Bangladesh, Archbishop Adams was named Apostolic Nuncio to Zimbabwe on 22 August 2002 and after serving five years in that country, on 3 September 2007 he was appointed Apostolic Nuncio to the Philippines. He has served as Nuncio to Greece since 22 February 2011. This news may speed up the process of finding Bishop Campbell’s successor as Bishop of Lancaster. £12,551.57 for the Holy Places. The Holy Father thanks us in anticipation for this year’s Good Friday Collection for ‘the Holy Places’ (in the Holy Land). Please note the time and place for the Sunday morning Mass for Palm Sunday. 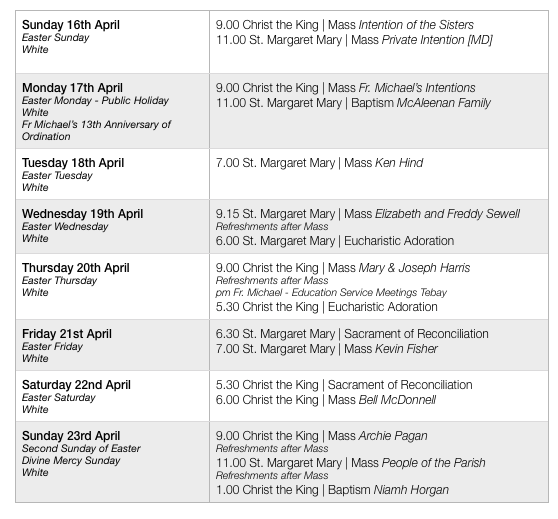 As previously advertised there will be one Mass in the parish at Christ the King at 10.00 am. The vigil Mass is the usual time. If transport is needed, please see Fr. Michael. 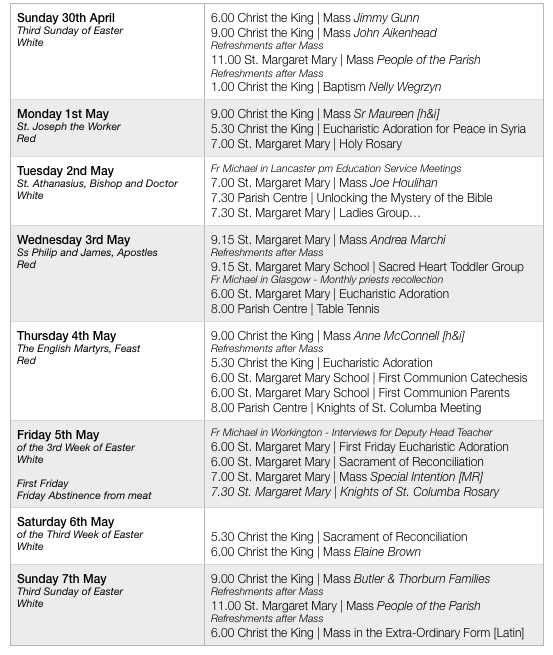 Holy Thursday: Mass of the Lord’s Supper - 7.00 pm - with ‘watching afterwards until 10.00 pm’. Good Friday: Liturgy of the Passion - 3.00 pm. 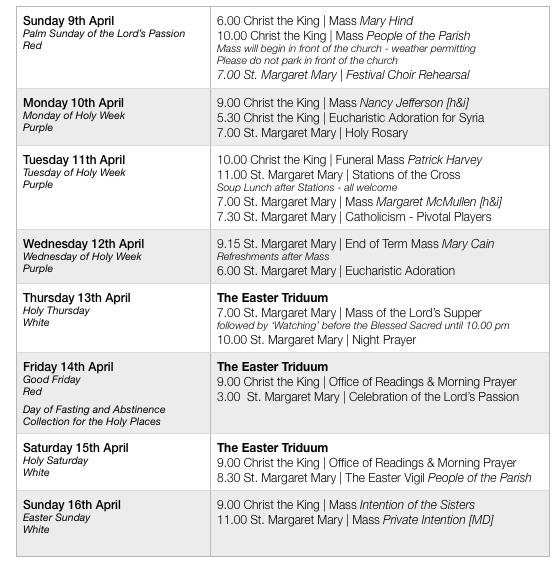 Easter Sunday Masses at the usual times in the usual places. The Walk of Witness from Our Lady & St Joseph’s Church to the Wayside Shrine at Wetheral Plains Road begins at 5.30 pm and lasts about an hour. Transport is available throughout the walk. The Church recommends the celebration of the Office of Readings on Good Friday and Holy Saturday. This will take place at Christ the King on Friday and Saturday morning. The next gathering will be this Tuesday, 11th April when we’ll consider GK Chesterton. Thank you to those who supported the appeal last weekend. £850 was raised towards the cost of sending William and Robbie on the Diocesan Pilgrimage to Lourdes in July. If there are any other young people, aged 16+, who would like to go - please let Fr Michael know. Thank you for your contribution of £436.80 + £244.45 = £681.25 There were 76 + 83 + 130 = 289 at Mass [wow] last weekend. Building Fund for March was £328 + £95 = £423. We meet each Sunday at 7.00 pm at St. Margaret Mary. We would really welcome new members. Our Lady and St. Joseph’s are running a bus to the Chrism Mass at our Cathedral in Lancaster on Maundy Thursday (13th April). This will leave OLSJ at 9.30 am and return at 3.00 pm. Cost £10. Sign up sheet at the back of church at OLSJ or email: ourladyofeden@gmail.com. Closing date 9th April. Carlisle World Shop, Lowthian’s Lane, off English Street, is stocking the Real Easter Egg which celebrates the true meaning of Easter, containing an Easter story booklet and Fairtrade chocolate. We would welcome donations to cover the cost of Easter flowers in both churches. Please place in an envelope marked ‘Easter Flowers’. The winning square was number 67. Congratulations to the winner! £100 was raised for the Lourdes Fund - thank you. St Joseph's Catholic High School (11 to 16), Workington, is currently looking to appoint the following staff: Senior Deputy Headteacher, the post requires the holder to be a practising Catholic; Maths Teachers; Science Teachers. For all details, please visit www.st-josephs.cumbria.sch.uk or contact Sybil Worsley, Business Manager on 01900 873290 or sw@st-josephs.cumbria.sch.uk. Congratulations to parishioner Mr Michael Merrick, who was recently appointed as Deputy Head Teacher of St. Cuthbert’s Catholic Primary School by the governing body of St. Ninian Catholic Federation. Fr. Michael will have spaces in his car for anyone wishing to attend the Chrism Mass in Lancaster on Holy Thursday morning. The Offertory Collection of Holy Saturday and Easter Sunday is, in the Diocese of Lancaster, a significant contribution to the stipend of parish clergy. In our parish, it is retained by the parish and contributes to Fr. Michael’s monthly ‘allowance’ over the year. Find time this week to re-read the Passion of Our Lord and to contemplate its significance. Try and keep a quiet house on Friday and Saturday. Maybe attend Mass this week or prayer the Sorrowful Mysteries of the Holy Rosary.